Dan Gemeinhart does it again! This book should really come with tissues because it ripped my heart out and made me cry happy and sad tears throughout the entire book. Rodeo and Coyote are a father/daughter duo that live on the road in an old school bus called Yager. They have been roaming the US for five years - ever since a tragic accident that left them both devastated. They have not been home in five years and Rodeo refuses to go back to their home in Washington State but Coyote learns that s Dan Gemeinhart does it again! This book should really come with tissues because it ripped my heart out and made me cry happy and sad tears throughout the entire book. Rodeo and Coyote are a father/daughter duo that live on the road in an old school bus called Yager. They have been roaming the US for five years - ever since a tragic accident that left them both devastated. They have not been home in five years and Rodeo refuses to go back to their home in Washington State but Coyote learns that she MUST go back when a beloved park is about to be torn down. In this park is a memory box that Coyote buried with her mom and sisters. Will she make it back? Will Rodeo and Coyote continuing grieving while criss crossing the United States in a bus? You will fall in love with Coyote and cry right along with her as you imagine going through the unimaginable like she is.Don’t forget my warning about the tissues. And you might want to read it alone. ❤😭📚🎧They all TOLD me to read this one, and they were RIGHT! I dug in yesterday afternoon and this morning when it was time for my walk I just couldn’t stop, so I switched to the audio version on Scribd and only took a quick break for my shower. I listened while I got ready for work, while I drove to work, and while I collected books for check in at work. I SOBBED in the car and my kids were like, “MOM, remember it’s FICTION!”.Oh, this is such a heart print book for me. It’s about family and grie ❤️😭📚🎧They all TOLD me to read this one, and they were RIGHT! I dug in yesterday afternoon and this morning when it was time for my walk I just couldn’t stop, so I switched to the audio version on Scribd and only took a quick break for my shower. I listened while I got ready for work, while I drove to work, and while I collected books for check in at work. I SOBBED in the car and my kids were like, “MOM, remember it’s FICTION!”.Oh, this is such a heart print book for me. It’s about family and grief, and friends and adventure. It will mean one thing to kids but as a mom, it absolutely broke and warmed my heart. I won’t stop thinking about Coyote and her family and band of friends for a long long time..Thanks a million to my #bookstagram friends @librarianmsg , @redcanoereader , @afomaumesi @whatkreads for inspiring me to pick this one up as soon as it was released and to Katherine Applegate for this amazing blurb on the back cover:.“Sometimes a story comes along that just plain makes you want to hug the world. Your heart needs this joyful miracle of a book.”.She was right. And Dan Gemeinhart thank you for this story. And for making me CRY. And feel all the feels. Thanks for Coyote. Thank you to Netgalley and Henry HoltBooks/Macmillan for the advance Kindle copy of this 1.8.19 release. All opinions are my own.•⭐⭐⭐⭐⭐/5 for this heartfelt adventure. Coyote and her dad have been on the road, living in a school bus for five years. They don’t talk about tragic past. When Coyote learns that the park where she buried something very important is about to be destroyed, she has to find a way to convince her father to go back to their hometown - the one place he says he will never go Thank you to Netgalley and Henry HoltBooks/Macmillan for the advance Kindle copy of this 1.8.19 release. All opinions are my own.•⭐️⭐️⭐️⭐️⭐️/5 for this heartfelt adventure. Coyote and her dad have been on the road, living in a school bus for five years. They don’t talk about tragic past. When Coyote learns that the park where she buried something very important is about to be destroyed, she has to find a way to convince her father to go back to their hometown - the one place he says he will never go again. With a quirky cast of characters and a lovable protagonist, this is sure to be a hit with middle school readers. I will be ordering multiple copies for sure! Many thanks to NetGalley and the publisher for providing me with an eARC of this title for review. All opinions are my own.This was AMAZING. There's really no other way to say it. I have been a fan of Gemeinhart since I first read The Honest Truth a few years ago, and have enjoyed many of other books. His writing style is so fantastic for middle grade readers. The stories are poignant, the characters are interesting, and the books always, always, tug on your heart-strings. I loved this. It coul Many thanks to NetGalley and the publisher for providing me with an eARC of this title for review. All opinions are my own.This was AMAZING. There's really no other way to say it. I have been a fan of Gemeinhart since I first read The Honest Truth a few years ago, and have enjoyed many of other books. His writing style is so fantastic for middle grade readers. The stories are poignant, the characters are interesting, and the books always, always, tug on your heart-strings. I loved this. It could easily be one of my favorite reads so far this year. I would call this a first purchase, must-buy kind of book. Highly recommend, for all the reasons, for all the readers.Coyote and Rodeo (don't call him her DAD, that's not what they do anymore) have been on the road in Yager, a big yellow school bus, for five years. It's been that long since the accident that took Coyote's mom and her two sisters. That long since they stayed in any one place. That long since they allowed themselves to look back and remember the past. Because as Rodeo says, it's a "no-go." And his no-gos are non-negotiable. But now, Coyote has found out that their old hometown is going to tear down a local park, the park where she and her sisters and her mother buried a memory box. One they were going to dig up in 10 years. One they would come back to and open together. So now Coyote is on a mission to get back to Washington State (she gets the news in Florida) and she has a strict deadline. And she has to do it without her dad figuring it out. No big deal, right?Along the way, Coyote and Rodeo pick up some other travelers, all carrying their own baggage and their own stories. And as they travel across the country, Coyote has to figure out what she is willing to risk in order to make her own rules. To make her own "no-gos." This is an incredible story of how one deals with grief and what it means to let go of the past. I cannot recommend this story enough and am so glad I got to read it. Oh, Dan Gemeinhart, why do you write such incredible books that rip me apart, then put me back together again. First it was The Honest Truth. Then came Good Dog. Not to mention Scar Island. Each so different, yet kept me thinking about them for days after finishing; each leaving an indelible mark on my heart. And then you give me Coyote and Rodeo and their Remarkable Journey. It’s a journey that takes them across many miles in a school bus-turned home (think a bright yellow tiny house on wheels. Oh, Dan Gemeinhart, why do you write such incredible books that rip me apart, then put me back together again. First it was The Honest Truth. Then came Good Dog. Not to mention Scar Island. Each so different, yet kept me thinking about them for days after finishing; each leaving an indelible mark on my heart. And then you give me Coyote and Rodeo and their Remarkable Journey. It’s a journey that takes them across many miles in a school bus-turned home (think a bright yellow tiny house on wheels.) More importantly, though, it’s a journey of the heart. To help heal what’s been broken. I can relate. Each additional character (read: passenger) so thoughtfully introduced, moves Coyote & Rodeo toward a place neither one of them thought they’d be, and through moments so real, heart wrenching, and gripping that I often found myself reading blurry words through tears and reaching for Kleenex so I wouldn’t miss a thing. To say I can’t wait until this book is out is an understatement. I have students that NEED Coyote’s perseverance, Salvador’s loyalty, and Rodeo’s heart right this very second. 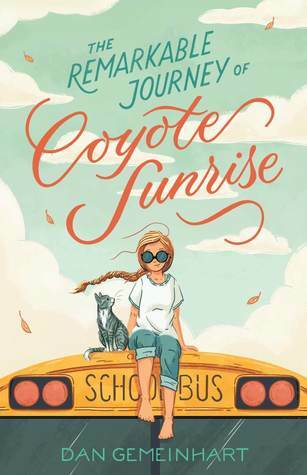 The Remarkable Journey of Coyote Sunrise definitely lives up to its name. This book is quite remarkable. It tells the story of not just Coyote's journey but also, in a way, of the journeys all the people that she meets throughout this book. When the story begins, Coyote is living on a refurbished school bus with her father and her cat Ivan (named after the gorilla in The One and Only Ivan -the first of many shout outs to amazing kidlit) and they travel from place to place because going home is t The Remarkable Journey of Coyote Sunrise definitely lives up to its name. This book is quite remarkable. It tells the story of not just Coyote's journey but also, in a way, of the journeys all the people that she meets throughout this book. When the story begins, Coyote is living on a refurbished school bus with her father and her cat Ivan (named after the gorilla in The One and Only Ivan -the first of many shout outs to amazing kidlit) and they travel from place to place because going home is too painful. But then Coyote learns that the memory box she buried with her down dead mother and sisters is about to be dug up because the park where they buried it is going to be bulldozed and Coyote knows that she has to return to get the box. She also knows that her dad, who refuses to be called anything but Rodeo, will never agree to go back to the town they left behind. So Coyote starts scheming up a way to get Rodeo to point their bus back in the direction of the memory box, without Rodeo realizing what they're doing. Along the way, they meet a variety of people who help Coyote but who also need some help of their own and who all agree to do what they can to help Coyote get back to the memory box before the park is bulldozed. Like I said before, I felt like this book was truly remarkable. I read most if it during trips to the gym and definitely had tears in my eyes throughout the majority of reading it -it's one of those crying in public type stories. All of the characters felt equally important and were likable, well-fleshed out characters. No one felt like they were just there to support Coyote's story -they all had stories, feelings, motivations of their own. It serves as a good reminder that the people we meet in life are living their own lives too, whether we know their stories or not. All the characters learn from one another and Coyote has a lot of her hard-held beliefs challenged by the people that she interacts with.This is a story about grief and how to process it and I think it is a great novel for young readers who might be dealing with different kinds of grief. All sorts of issues are addressed in this story (grieving of the loss of a loved one, making decisions about what direction your future should take, dealing with an abusive family situation, struggling to come out to parents) and Coyote (and the readers) realize that sometimes the only thing you can really do is listen to someone when they tell you about the things they are experiencing. Several times throughout the book, Coyote is dealing with things or emotions that are painful and says simply "it hurt. And that was okay." And I think that's such an important lesson before people to learn at any age and an important thing we can tell to children: sometimes it hurts, and that's okay.Ultimately this was a story about a father and a daughter and how the roles and dynamics can sometimes change. I think that there will be plenty of young readers who identify with the fact that, for so long, Coyote is a caregiver and protector for Rodeo. Coyote eventually learns how to put herself first and be the child again, which is another powerful and important lesson. This is the type of book where a character is on a crazy, somewhat hopeless quest, but you want that character to succeed no matter how helpless the odds. You want the characters to grow, to learn, to change, and to come together different but stronger than before.I felt like this book was very powerful. One of the best books I have read this year, hands down. It is the story of growth and struggle and heartache and it tackles painful and difficult issues head-first and with unflinching reality. I enjoyed reading every word and it kinda made me want to take a remarkable journey of my own. Dan Gemeinhart creates an excellent, intelligent, compassionate, sympathetic heroine in Coyote and she has a very unique, entertaining, clever voice that fills the whole novel. This is definitely one I wouldn't mind revisiting again in the future! Thanks to Netgalley for the ARC! E ARC from Netgalley.comCoyote and her father, Rodeo, travel around the US in a converted school bus they call Yager. Their life seems pretty comfortable, and they go wherever they want (especially if it involves some really good destination food), but they are on the road because of a sad reason. Coyote's mother and two sisters were killed in a car accident, and their father coped so poorly that he had to sell their house, leave their town, and doesn't even want to call Coyote by her real name E ARC from Netgalley.comCoyote and her father, Rodeo, travel around the US in a converted school bus they call Yager. Their life seems pretty comfortable, and they go wherever they want (especially if it involves some really good destination food), but they are on the road because of a sad reason. Coyote's mother and two sisters were killed in a car accident, and their father coped so poorly that he had to sell their house, leave their town, and doesn't even want to call Coyote by her real name or be referred to as her father, because it makes him remember too much.When Coyote talks to her grandmother, who tells her the park near their old home is going to be torn down, Coyote wants to get back in time to retrieve a time capsule that her mother and sisters left there just five days before their death. Since she can't tell her father, she makes an excuse to travel somewhat nearby to get a special sandwich. Her father can't drive enough to get from Florida to the Pacific Northwest, so when Coyote finds a young musician who wants to travel there to see his girlfriend, she invites him along. Rodeo has done this and the past, and has series of questions for people to answer. The answers are correct, and they are on their way. They also pick up Salvador and his mother, who are fleeing his father, after Coyote is accidentally left at a gas station. They also pick up an 18-year-old runaway, Valerie, who has been kicked out of her home because she is gay. Any cross country trip will have incidents, and there are incorrect connections, break downs, and general mayhem. Will Coyote be able to make it back, and will her father eventually realize that she needs to talk about her past in order to go on with her future?Strengths: A good road trip story is always good, from Cooney's On the Road to Pla's The Someday Birds. The bus is a fun vehicle, the aimlessness appeals to the middle grade soul, and there is a lot of good relationships and adventure. While this is a little different from Gemeinhart's previous books, it shows me that he has studied up on the current climate in middle grade literature. Several topics that are currently in favor are in play here-- a dead parent, LGBTQ+ character, and domestic problems. The cover is good as well. Weaknesses: I would think that people who had lost a loved one would be really insulted by all of the literary characters who become completely dysfunctional when they are grieving. I liked that the funding for the constant traveling was explained (insurance settlement), but the father's aimlessness, combined with his unwillingness to parent Coyote in an effective way, is inexcusable. While not talking about the departed is an excellent way to deal with it, the needs of a child come first, and Coyote should have been near her grandmother and in a whole lot of grief counseling. What I really think: While I very much personally disliked the portrayal of a grieving parent, this is a good story, and I will be purchasing it for my library. Thank you @kidlitexchange @macmillankidsbooks and @dangemeinhart for the review copy of this book. All opinions are my own. The Remarkable Journey of Coyote Sunrise will release 1.8.19 and needs to be at the very top of your must read list at the start of the new year!! !This middle grade story follows Coyote and Rodeo, a daughter / father duo who drive and live in an old school bus better known as Yager. Upon first impressions, people might be leery of their hippie vibes, but those opinions chan Thank you @kidlitexchange @macmillankidsbooks and @dangemeinhart for the review copy of this book. All opinions are my own. The Remarkable Journey of Coyote Sunrise will release 1.8.19 and needs to be at the very top of your must read list at the start of the new year!! !This middle grade story follows Coyote and Rodeo, a daughter / father duo who drive and live in an old school bus better known as Yager. Upon first impressions, people might be leery of their hippie vibes, but those opinions change the moment someone sees the honesty in Rodeo’s eyes and the overall kindness that surrounds the two. You’d never imagine that both are broken and struggling with deep grief. It’s been five years since the accident that took the lives of a mom/wife and two sisters/daughters. From that moment on they’ve been running from reality, traveling the country and never speaking of the past. All of that changes when Coyote finds out that a park is being demolished in her old hometown. A park where she buried a memory box with her loved ones just days before their accident. A box full of memories and a promise to return for it. Oh this book!!!! The story, the lessons and the characters will stick with me for a very long time. I laughed, I cried, I laughed harder and I was absolutely crushed. First off, Gemeinhart’s writing style is so warm and realistic. The descriptions are perfect making it easy to picture every little detail. I will forever grin when I see a watermelon slurpee from now on! The characters are so special and just a well rounded group. Along their journey, they unexpectedly pick up a cat, five extra people and the best goat in the world!!! All need help in one way or another and all play a significant part as the story progresses. This book teaches you about grief, depression, never being too quick to judge a person and most importantly how important it is to speak up for yourself. It contains so many wonderful quotes and helpful insights. I want to ask everyone I instantly meet those 3 important questions - What’s your favorite: book? place in the whole world? and sandwich? ?This is a five star read, a must buy and a book that will be highly talked about next year. Definitely don’t miss this one. It’s simply middle grade fiction at its best!! Best one yet of Dan’s novels. Love his writing and stories. This is an emotional one. Thanks to Netgalley for an ARC of this book.Dan Gemeinhart, you continue to rip my heart out with your words! I fell in love with Coyote from page one along with all the other characters in this book. I rooted for her during her entire journey. The students in my school will be fighting over access to this book when I get hardcopies. Loved this one! Coyote and her dad are driving all around the country in a converted school bus. She's home schooled, and they see the whole US. But there's one place her dad won't take her--home to Seattle. See, a few years ago Coyote's mom and two sisters all died in a terrible car accident. Coyote was supposed to be in the car that day too. And it's just been way too much to deal with. So they don't. They drive around to cool places, Coyote reads, she adopts a kitten named Ivan.One day she calls her grandmot Coyote and her dad are driving all around the country in a converted school bus. She's home schooled, and they see the whole US. But there's one place her dad won't take her--home to Seattle. See, a few years ago Coyote's mom and two sisters all died in a terrible car accident. Coyote was supposed to be in the car that day too. And it's just been way too much to deal with. So they don't. They drive around to cool places, Coyote reads, she adopts a kitten named Ivan.One day she calls her grandmother back home, and gets some bad news. There's a park in their old neighborhood that's going to be torn down for a developer to build something. In that park, a month or so before they died, Coyote and her two sister and their mom buried a memory box. Coyote can't tell her grandmother where exactly it is although she knows she can find it. But that means she has to get her dad to drive back to Washington. And she has just over a week to do it. They're in Florida.So first she meets a boy her age. He and his mom are trying to travel to St. Louis where his aunt has a better job for his mom but their car broke down, so she offers them a ride. That will get her halfway home. Then she figures out they need another driver to spell her dad so she overhears a man in a diner talking about needing to get out west and she offers him a ride too. Eventually they pick up a few other people, and this motley crew of strangers becomes friends.But will Coyote get to Washington in time? Will she and her dad finally deal with the grief they've been running away from? Will she ever have stability in her life?This was a wonderful story about friendship, about family, about how family can be the people we surround ourselves with, about trust and love, and ultimately about dealing with grief. It's a very positive fun road trip story, with the grief part only being a bit at the end. It's handled very well and Coyote is a wonderful girl who is having an unusual life but who you just know will turn out great one day. This newest offering by Dan Gemeinhart just may be my personal winner of the year, both my current reading year (2018) and maybe even its publication year (2019); it's that good. This is one that most fans of sad-happy heart warmers will want to read all in one sitting and may be tempted to skim in order to get to its lots of Kleenex required conclusion, but don't do it. If skimmed, readers will miss some fantastic descriptions, filled with enough sensory imagery that an ELA teacher will be high This newest offering by Dan Gemeinhart just may be my personal winner of the year, both my current reading year (2018) and maybe even its publication year (2019); it's that good. This is one that most fans of sad-happy heart warmers will want to read all in one sitting and may be tempted to skim in order to get to its lots of Kleenex required conclusion, but don't do it. If skimmed, readers will miss some fantastic descriptions, filled with enough sensory imagery that an ELA teacher will be highlighting passage after passage, and the more philosophical readers will miss sections that force them to think about ways to be kind to others while not forsaking one's self, and how to handle the "gone" of losing someone without forgetting them, plus what makes a person be a true friend, a dad, or a daughter....I was intrigued by Coyote's remarkable journey with her hippy-dippy father in a retrofitted school bus from the first few pages and followed her excitedly as she added more great passengers to their unusual vehicle and wondered if she would ever get to her final destination with her soul, spirit and maybe even body, intact. Librarians and readers of literature geared to the grade 5 and up crowd will want this one on their bookshelf. Those who are looking for diverse books to include in their collections will find two characters who seem to be Caucasian, two who are clearly Hispanic, one African-American, and one who states that she is gay without including any details of that lifestyle. For full disclosure: There are a few instances of profanity: one g-d, and two h-e-double toothpicks. Gemeinhart also uses lowercase letters for God in a passage about the glory of nature and again later on. No sexual innuendo and no violence...unless you count a little goat on policeman action that is totally appropriate and a welcome tension reliever! Highly, highly recommended and thanks to NetGalley for its digital ARC. Coyote and Rodeo (her father) live on the road in an old school bus. The school bus has been adapted to meet their needs with places to sleep, sit, and even cook. And for the most part, Coyote is content with this lifestyle that has been hers for the last five years. That changes though when she gets word from her Grandma that the park where she buried a memory capsule with her mother and sisters is being torn up. Coyote desperately wants to retrieve the capsule but she knows her father has no i Coyote and Rodeo (her father) live on the road in an old school bus. The school bus has been adapted to meet their needs with places to sleep, sit, and even cook. And for the most part, Coyote is content with this lifestyle that has been hers for the last five years. That changes though when she gets word from her Grandma that the park where she buried a memory capsule with her mother and sisters is being torn up. Coyote desperately wants to retrieve the capsule but she knows her father has no intention of ever returning to the town that reminds him so much of the accident that took the lives of his wife and daughters. So Coyote sets out to manipulate her father into taking her back. The problem is that she only has a week to get herself and her father from Florida to Washington. Along the way, Coyote and Rodeo pick up some passengers, Lester who wants to get to Boise, ID to see his former girlfriend (or does he? ), Salvador and his mother who are fleeing an abusive situation, and Val, whose parents have kicked her out. But everything is set in motion by the arrival of a tiny kitten. But can Coyote continue to lie to her father? Especially the closer they get to their former home?Gemeinhart has written a book that is all heart. Coyote won me over from the first page as she talks about her adoption of Ivan (the kitten). And the idea of living on the road in a school bus is certainly an intriguing one. The other people that Coyote and Rodeo reach out to along the way also helped make the story as strong as it is. Lester, a good guy who loves music and wants to be in a band, but who also cares for his ex-girlfriend and whom Coyote convinces to join them to help drive the bus. Salvador and his mother, who finally left the his father in search of a new job, and who Coyote invites to join them after they help her out of a jam. This is a tender story of a family trying to find their way and extending kindness to others along the way. I could have done without all the swearing/profanity, but those readers who aren't bothered by that will find themselves unable to resist an endearing Coyote and her determination to achieve her goal. Meet the lovable, strong, determined, and downright fabulous Coyote Sunrise. Along with her father Rodeo, she travels the country in Yager, a large yellow school bus that’s also their home. Five years before this traveling began, Coyote’s mother and two sisters were killed in a car accident. Now Rodeo and Coyote go wherever they feel like it. They changed their names, got on Yager, and the rest is history. Well, at least, it would have been history if Coyote didn’t find out the park in her old n Meet the lovable, strong, determined, and downright fabulous Coyote Sunrise. Along with her father Rodeo, she travels the country in Yager, a large yellow school bus that’s also their home. Five years before this traveling began, Coyote’s mother and two sisters were killed in a car accident. Now Rodeo and Coyote go wherever they feel like it. They changed their names, got on Yager, and the rest is history. Well, at least, it would have been history if Coyote didn’t find out the park in her old neighborhood is being torn up. Once she hears that, she knows she needs to get back there. Before her mother and sisters died, they buried a special memory box there and promised they would open it together in ten years. Coyote knows Rodeo never wants to go back, so she decides a plan to get there. Along the way, they meet a bunch of other travelers who join them aboard Yager, starting with Ivan the cat. Pretty soon, Coyote knows her journey must end, but will she get her “happily ever after”? I wish I could give this book more than five stars. I loved The Honest Truth and Some Kind of Courage, but this book is, without a doubt, my favorite of Dan Gemeinhart’s. I know 2019 just a started, but I know it will still be at the top of my list at the end of December. Do yourself a favor and pick it up. You’ll need to be prepared to shed some tears, but it will be worth it. Tonight, I’ll be picking it up and starting it all over again with my family. Some losses are too tragic to imagine but they are even harder when you are discouraged from remembering or talking about them. That is the situation for Coyote Sunrise. Her father has taken her on the road for the past five years, living on a a school bus called Yager, never stopping long enough to make friends. Her once a week call to her grandmother brings unexpected news and Coyote must make a trip back to her original home to rescue what is left of her precious life and and keep those memor Some losses are too tragic to imagine but they are even harder when you are discouraged from remembering or talking about them. That is the situation for Coyote Sunrise. Her father has taken her on the road for the past five years, living on a a school bus called Yager, never stopping long enough to make friends. Her once a week call to her grandmother brings unexpected news and Coyote must make a trip back to her original home to rescue what is left of her precious life and and keep those memories alive. It is a race against time as a scheduled demolition could destroy them, but her father (Rodeo) refuses to return to their 'home'-it is far too painful. How can Coyote find a way to get Rodeo to return in time? Some unexpected passengers turn out to hold the key to their fate. Their journey truly IS remarkable! I have been a Dan Gemeinhart fan since THE HONEST TRUTH, but this book is hands down my favorite. Dan doesn't shy away from pain in his books, but he finds a way to make readers feel whole and hopeful no matter what. You will LOVE, LOVE, LOVE this story and all of the beautiful characters! Releases Jan 8, 2019. Preorder it if you can-you will want this ASAP! Thank you to NetGalley and the publisher for an ARC of this book.This is my last book review of 2018. Here's the thing, I like the story, I like the characters, and I like the message....BUT...I cannot give this book more than three stars because I am so disappointed with the use of so many curse words. I understand that the kids hear them, but we tell them not to use them, so why is it okay to have those words (They are not the super bad ones, but there were a lot.) in a middle grade book? This Thank you to NetGalley and the publisher for an ARC of this book.This is my last book review of 2018. Here's the thing, I like the story, I like the characters, and I like the message....BUT...I cannot give this book more than three stars because I am so disappointed with the use of so many curse words. I understand that the kids hear them, but we tell them not to use them, so why is it okay to have those words (They are not the super bad ones, but there were a lot.) in a middle grade book? This is a children's book! I love Dan Gemeinhart as an author, and I am VERY sure that this book will fly off of the shelves because of the great story. Kids will enjoy it. Also, I think it might be a little longer than his other books, but I had an e-book, and it was hard to judge. All of that being said, I will purchase it for my library, but I will only be booktalking it in middle school and up after it comes out. All of that being said, please read it...it gives you all of the feels. The last few times I read a Dan Gemeinhart novel I have finished saying, "I have no clue which of this guy's books is my favourite." And it happened again with this book. I guess it is pointless to compare, but I can't help it.More to the point, THIS book is excellent. It has amazing characters whose thoughts and feelings become part of you. It's a great adventure with all of the feels represented. If you’ve ever read anything by Dan Gemeinhart, you know it’s going to pull at your heart. It’s going to bring feelings to the surface and you can’t help but wear all of those emotions on your sleeve as you finish reading the story. This book does that and more. I think this is Dan’s best book, yet. He does an amazing job fleshing out the character of Coyote and letting the reader get to know her and see all of her ups and downs. Always looking forward to more from Dan. I loved this book! It was a beautiful and sad story about a father and daughter and their adventures and coping with immense grief. It will make you laugh and cry. Every character is memorable and contributes to the story. I would highly recommend this middle school book. I need to gather my thoughts, but EVERYONE needs to read this book. I promise, it's THAT good. A story about family, forgiveness, friendship and finding where you belong. Full review coming soon. Stunning. Wow. This is Dan’s best book. Thank you Netgalley and publishers for an ARC!This is my first Dan Gemeinhart book and it was wonderful!! This would be most appropriate 6th-8th graders and fans of Because of Winn Dixie.Coyote is a hoot! She makes friends wherever she goes. There are several characters in this story that readers will identify with.Readers will laugh, root, and cry along with Coyote and those she meets. Buckle up for this remarkable journey!! The title of this book says it all. Coyote and Rodeo are a father-daughter duo who live in a refurbished school bus named Yager. They have been traveling across the US for the past five years, after a tragic and devastating accident in their family. While they have traveled to many exciting places, they have not been back home since they left. Coyote learns that the park where she buried a memory box with her mother and sisters is being demolished and she knows she must go back and retrieve it. The title of this book says it all. Coyote and Rodeo are a father-daughter duo who live in a refurbished school bus named Yager. They have been traveling across the US for the past five years, after a tragic and devastating accident in their family. While they have traveled to many exciting places, they have not been back home since they left. Coyote learns that the park where she buried a memory box with her mother and sisters is being demolished and she knows she must go back and retrieve it. The only problem is that she knows the memories associated with home are too painful for Rodeo and he will refuse to go back. Coyote develops a plan and along with the help of the other passengers they pickup on the way, they do everything they can to get Coyote home in time to get the monkey box. This isn't just the journey of Coyote and Rodeo but also of the other passengers they encounter on the way. Each of the passengers is on their own journey with their own struggles and issues they need to work through. They all commit to helping Coyote just as she helps many of them. I felt this book was truly remarkable. It's about grief and how to process it. It's about a variety of struggles and how different people cope. I think this would be great for all middle grade students who are going through the grieving process and need to relate to someone. Bring your tissues because you will have tears from laughing and crying as you climb aboard Yager and go on the journey with Coyote, Rodeo, and all of the incredible passengers. I have a feeling this book is going to win all of the awards it's nominated for. Thank you to NetGalley and the publisher for providing this eARC. Thankful that I was able to read an ARC of Dan Gemeinhart‘s latest through my #bookexpedition group. If I could give this book 10 ⭐s, I would. Coyote and her dad Rodeo live a life on the road in a 2003 yellow school bus named Yager. They’ve been traveling the roads of the US, not headed towards something but headed away from it ~ it being a tragic accident that changed their lives forever. During a phone call with her grandmother, Coyote learns that the park in her old neighborhood is being demo Thankful that I was able to read an ARC of Dan Gemeinhart‘s latest through my #bookexpedition group. If I could give this book 10 ⭐️s, I would. Coyote and her dad Rodeo live a life on the road in a 2003 yellow school bus named Yager. They’ve been traveling the roads of the US, not headed towards something but headed away from it ~ it being a tragic accident that changed their lives forever. During a phone call with her grandmother, Coyote learns that the park in her old neighborhood is being demolished. That very same park houses a treasured memory box that Coyote needs back in her hands.During this journey, Coyote & Rodeo pick up an amazing cast of characters who each bring something wonderful to the story. I loved these added characters as much as Coyote & RodeoI laughed out loud as much as I cried while reading this book. A must buy for your middle grade readers! Pubs January 2019. Favorite quotes: Page 160: “Sometimes trusting someone is about the scariest thing you can do. But you know what? It’s a lot less scary than being all alone.”Page 262: “My feelings were so big they were choking me and squeezing the air out of my lungs and pushing the tears out of my eyes and I couldn’t breathe or see and all I could do was feel, feel, feel.”Page 338: “ Maybe we’re all a little broken. Maybe we’re all a little fragile. Maybe that’s why we need each other so much. Interest Level: 3-6Do you think it would be fun to have your house be a school bus that was gutted and turned into a home? You could go just about anywhere in the US whenever you want. Fun, right? Well, Coyote Sunrise didn't have a problem with it, at least not until everything changed. Coyote and her dad, Rodeo, have been traveling the country for five years, ever since the day her mom and two sisters were killed in a car wreck. Since then Ella has been called Coyote and her dad has been Rodeo. ​Interest Level: 3-6Do you think it would be fun to have your house be a school bus that was gutted and turned into a home? You could go just about anywhere in the US whenever you want. Fun, right? Well, Coyote Sunrise didn't have a problem with it, at least not until everything changed. Coyote and her dad, Rodeo, have been traveling the country for five years, ever since the day her mom and two sisters were killed in a car wreck. Since then Ella has been called Coyote and her dad has been Rodeo. They live life on the road stopping at gas stations and truck stops all over America. Every Saturday Coyote calls her grandmother but everything changed when her grandmother told her that they were going to be bulldozing the playground next to their old house. Coyote knows that she has to get back home to a memory box that her, her mom, and her sisters buried five years earlier, just five days before their death. The problem is that going home is a no-go for Rodeo so she is going to have to trick him. She knows she only has a few days to get across the country so she has to rely on the help of strangers to help. Along the way they take on these people (and even a couple of animals) who need help themselves getting to where they need to go. Little do they all know that they would become a family on that bus and they will all do whatever it takes to get Coyote to that memory box on time. Can they overcome a broken brake line, someone being left behind at a gas station, Rodeo finding out the truth, and multiple police? Will Coyote be able to make it back to her home town of Poplin Springs in time to save her memory box? Will Rodeo and Coyote ever be the same again? Read this amazingly incredible story of family, friends, love, loss, and one incredible journey!All I can say about this story is WOW! There are not many stories that will have you laughing and crying over and over again. I want so bad to be on that bus with this incredible group of people (and animals). I wanted so bad to get some pom-poms and and cheer this group the whole way across the country. This is a Newbery Award winning book waiting to happen. Do! Not! Miss! This! Book!!!!!!! Holy... Wow. Okay...This is one of my top books of the year. No question about it. It’ll even become my staff pick at my bookstore when it is finally released. This is an absolutely remarkable book. Five years ago her mom and two sisters died. Five years and five days ago they all buried a memory box with letters about why they loved each other. It’s Sunday now and the park is going to be demolished on Wednesday. Coyote has a mission and it’s to get that box back. Only problem? Rodeo -her dad, b Holy... Wow. Okay...This is one of my top books of the year. No question about it. It’ll even become my staff pick at my bookstore when it is finally released. This is an absolutely remarkable book. Five years ago her mom and two sisters died. Five years and five days ago they all buried a memory box with letters about why they loved each other. It’s Sunday now and the park is going to be demolished on Wednesday. Coyote has a mission and it’s to get that box back. Only problem? Rodeo -her dad, but don’t call him that- would never agree to it. Thus begins Coyote’s long con into getting Rodeo to where she needs to be.With an incredible cast of characters to help her along the way it just might happen. And it all starts with a cat. This book floored me with its sweetness and yearning to connect with the ones you love; wether they’re alive or dead. I laughed, I cried, I hugged the book, but most of all I felt this in my soul. Coyote’s journey is a unique and powerful way to get us all to face our pasts, teach us what love is, and the importance of never getting a watermelon slushee.